Associate Professor Hugh Bruck has been recently elevated to the rank of Professor of Mechanical Engineering, effective July 1, 2010. This promotion is in recognition of his scholarly publications, research, teaching, and overall service to the engineering profession. 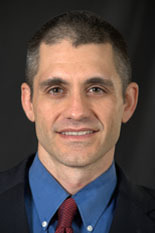 Bruck’s interests lie in polymer processing of functionally graded materials, smart materials, multifunctional materials, and nanocomposites; particulate material processing of functionally graded materials and nanocomposites; thin film processing of nanostructured functionally graded materials; finite element modeling of functionally graded and multifunctional materials; microstructural and mechanical characterization of functionally graded materials, smart materials, multifunctional materials, nanocomposites, and biologically inspired heterogeneous structures; and mathematical techniques for optimizing the design of functionally graded and multifunctional materials. He is most well known for the development and characterization of Functionally Graded Materials (FGMs) and nano-composites. Bruck is currently completing research at the University’s Functionally Graded Materials (FGM) Development Lab where his group designs and fabricates FGMs for use in energetic and porous materials, smart structures and also microelectromechanical systems (MEMS) devices. Bruck has greatly contributed to the Laboratory’s development into a distinguished facility for this research. In addition to numerous publications in his areas of expertise, Bruck has won several awards and honors for his research. In 2007, he won the Pi Tau Sigma Faculty Appreciation Award, and in 2006 he received the A.J. Durelli Innovative Young Researcher Award. Bruck is the Associate Editor of Experimental Mechanics and is a member of the National Science Foundation (NSF) Proposal Review Panel on Civil and Mechanical Systems. Bruck received his Ph.D. in Materials Science/Applied Mechanics in 1995 from the California Institute of Technology. He received both his B.S. and M.S. degrees in mechanical engineering from the University of South Carolina, Columbia, in 1988 and 1989, respectively. For more information on Dr. Bruck’s research, please visit his website.